Once the harsh winter had begun to thaw, and caravans started rolling back into the area, citizens of Crystal Creek had their work cut out for them. After the massive horde of zed had been cleared out, efforts began to repair both the buildings and the government. Representatives were elected, though many expressed doubt as to their efficacy, given the laughable attempt at a council last summer. While the town had already seen some of the deadly local fauna, they weren’t quite as prepared to be attacked by the flora. With the unexpected help of Doctor Faizer, kudzu raiders were reduced to a memory, along with many other raiders after the events of Devil’s Den. But it seemed there was no rest for the weary; instead of raiders, new diseases began to plague the area, and even the gravemind itself seemed sick when pustules began to appear in the ground. Those who turned to faith for guidance were disappointed; prayers seemed to offer no comfort, and calls to any Almighty were left unanswered. While the doctors rushed to cure or inoculate the unprecedented lung disease, priests and Ascensorites convened to repair the withering faith of the town. A council of Ascensorite priests came forth with a solution, but it wasn’t easy. A horde of zed, a locked box, a wooden puzzle, and a mass-grave dive later, the local Ascensorites emerged from the morgue with a healthy glow and a renewed grasp on their respective faiths. As autumn fell upon the Riverlands, it became clear that the citizens of Crystal Creek were not the only ones with a stake in the area. A relative crowd of Voorhees gathered in search of their origins, and the second annual Givethanksmas Feast was overshadowed by the Pureblood Clinton family proclaiming that they had legal written ownership of the land where Crystal Creek was built. As citizens departed ahead of the winter horde, it was clear that they were not yet done fighting to make Crystal Creek their home. Our story began with a large caravan that was heading north around Misery Bay. The travelers on this caravan were surprisingly greeted by a group of Natural Ones called the Iron Tusks. 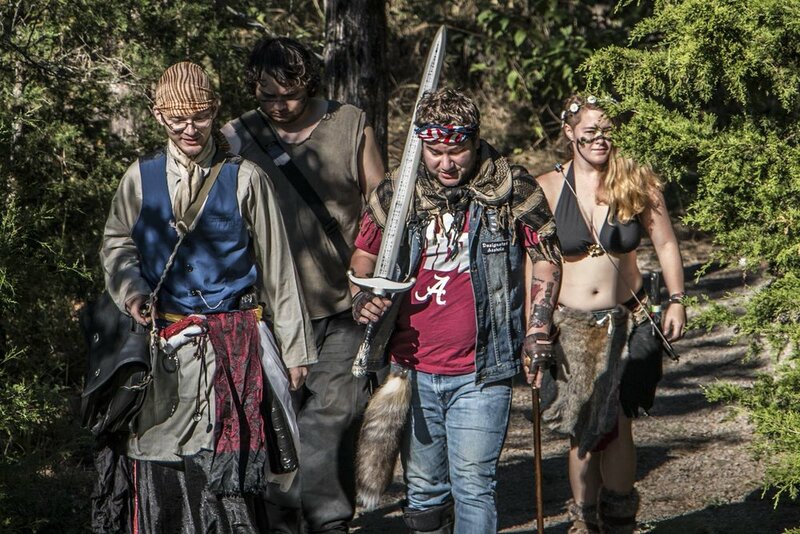 Together the survivors and Iron Tusks finished clearing out the town of Crystal Creek from the undead. When the dust settled, some decided to continue on their way north, while others decided to stay and explore this new town and surrounding area. The tenious relationship between the new townsfolk and the Iron Tusks deteriorated rapidly. The townsfolk were displeased with the ban on guns, and the restrictions placed on whoring. The Iron Tusks leaders were angry at the influx of psions, that they assumed were within the townsfolk. They were also displeased at the general presence of outsiders on their lands, corrupting the minds of the younger members of the group. Inevitably the relationship devolved into a civil war. On one side were the older Iron Tusks, fighting to keep the society that they had built on their own sweat and blood. On the other side were the younger members of the Iron Tusks and the townsfolk, who were seeking to throw off what they thought was a repressive, xenophobic group that was unwilling to adapt to the ever changing world. After the screams died down, and the wounds were tended, the Townsfolk and younger Iron Tusks prevailed……and set their sights on building a new community. As the new year began, before the winter thaw, a small group of Crystal Creek citizens weaseled their way into the heart of the supposed enemy fortress, Spire Islands. While they learned a lot about the economic prowess of the Pureblood city, not everyone made it back out. Two citizens were delivered back to Crystal Creek in chains, with a pile of consequences on their shoulders. As the town collected itself and prepared for the trade season, it was agreed that massive changes to the government were needed, for everyone's sanity. A new model was agreed upon, and council elections were held the following trade meet… with less than spectacular results, as voter fraud and condemnation by the Post Office came to light. Nonetheless, the new government model held together, and with some trial and error, seemed to be a lasting solution. As spring warmed into early summer, the town's faith was tested once again, as well as their resourcefulness when the dam washed out, destroying the hydro-powered generators and the water purifier. In the interests of clean water, local merchants became far more interested in coal. As summer faded into autumn, Crystal Creek residents began emerging from the morgue, after deaths that occurred decades ago. The season of fear held to trend, when citizens arrived into town and found they were unable to speak above a whisper. The coal-obsessed merchants from months prior turned out to be wordless Nemesii, who sought to take hearts, some more than politely than others. As the season drew to a close, the Givethankmas feast saw a treaty with Spire Islands signed, and citizens seemed hopeful that the fight against slavery would soon be over.